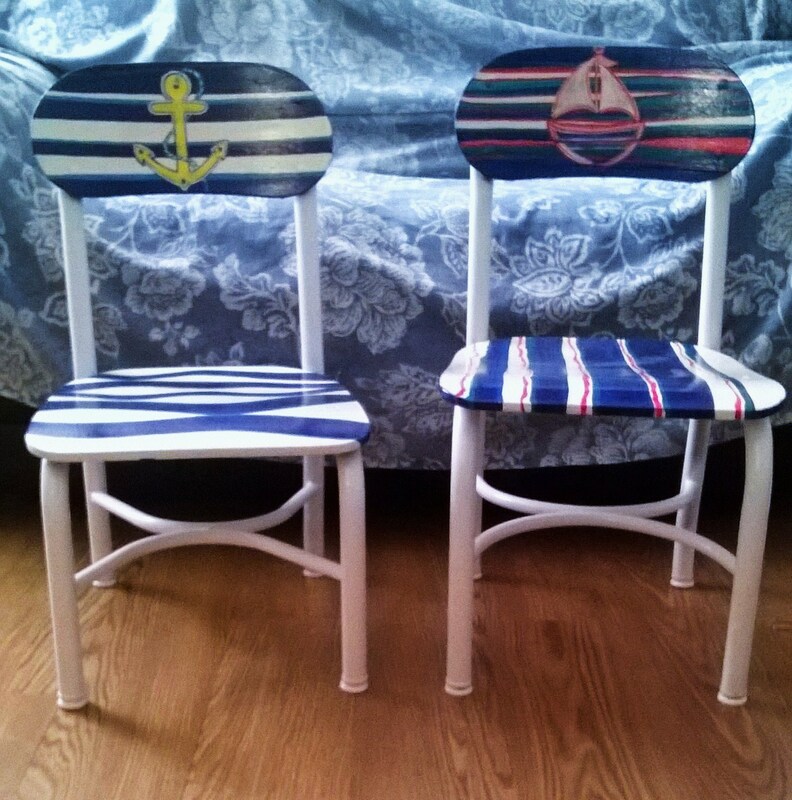 Last summer of 2014, I refurbished these Vintage children’s school chairs. This project I envisioned with great pride, as it was for two of my grand-children. Yes, I’m a grandmother! The child-sized chairs you see here were pretty much in good condition when I first saw them. They had a few scratches and minor layers removed from the wooden backs and seats in certain spots, as well as, minor rust in their sturdy metal legs. Originally, these were salvaged by the children’s paternal grandmother, an educator from an elementary school where they were getting replaced. I’d mentioned to my daughter how the chairs appeared so sturdy, it would be a shame to just leave them in their poor aesthetic condition. That’s when we began going over the idea of refurbishing them. Since we all enjoy summertime activities which include swimming and water sports, she browsed through images along those themes for ideas. We decided to give them each a unique design, since the kids are a boy and a girl with different likes, although they are quite balanced when it comes to playtime. Aside from their differences, we still wanted to keep a complementary color theme. Thank you for visiting! I hope you enjoyed viewing this project and return frequently for updates. Follow to receive news on all the latest posts and projects.